Ever since the United Nations declared June 8th to be World Oceans Day in 2002, people and groups from around the world have used the occasion to celebrate the ocean and take steps to protect it. Now, with the ocean facing more threats than ever, it’s time for all of us to come together to protect our treasured marine environment. Our federal leaders are waging an unprecedented assault on the ocean. The Trump administration has proposed new offshore drilling in over 90% of U.S. waters, while targeting marine protections for potential repeal. Meanwhile, plastic pollution continues to proliferate in our ocean, choking and entangling marine wildlife, as government leaders and corporate interests refuse to take meaningful steps to address the problem. This is why grassroots action is desperately needed to protect the health of our ocean. As Mahatma Gandhi famously said, “If the people lead, the leaders will follow.” So, on June 8th, let us all be reminded of our responsibility as ocean advocates to protect this incredible resource for now and the future. The administration and members of Congress need to hear from people who value the ocean and oppose proposals that would damage the marine environment. Please visit Surfrider’s Stop Offshore Drilling campaign page to learn how you can take action to defend our coastlines from new oil rigs. Please also complete this action alert to urge your representatives to support our Marine Sanctuaries and National Monuments. Or better yet, pick up the phone and call your representatives in the Senate and House! For more information on Surfrider’s Ocean Protection initiative click here. 2) Reduce your consumption of plastics with a #ZeroPlasticLunch! Plastic pollution represents one of the greatest threats to the health of our ocean. Every year, millions of tons of plastic enters marine waters, wreaking havoc on wildlife and ecosystems. That’s why the theme of this year’s World Oceans Day is preventing plastic pollution and encouraging solutions for a healthy ocean. Surfrider is participating with the #BreakFreeFromPlastic movement with CNN to ask students from our club network and around the world to celebrate #WorldOceansDay with a #ZeroPlasticLunch. Students, you can join by sharing photos of your lunch on social media using the hashtags #ZeroPlasticLunch and #breakfreefromplastic. Also, be sure to tag @surfrider with changes you made to your meal and why. For more tips on reducing your consumption of plastics, please visit Surfrider’s Rise Above Plastics page. 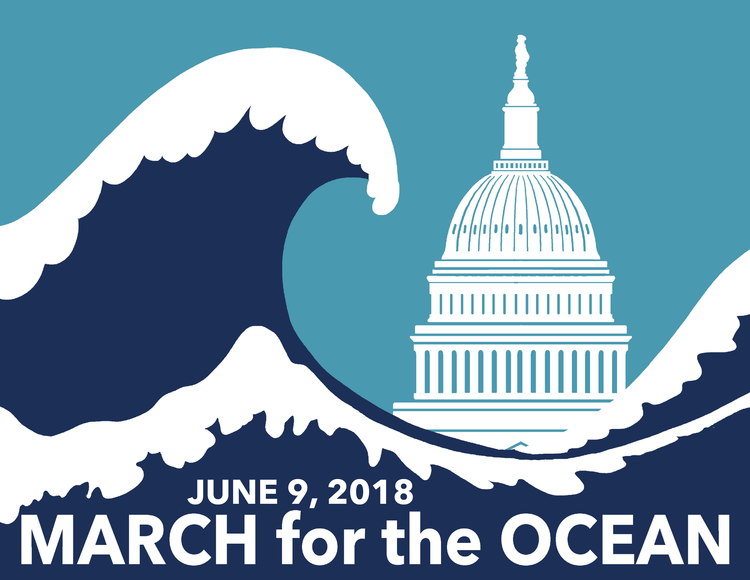 On Saturday, June 9th, ocean advocates are assembling in Washington D.C. and sister events around the country to March for the Ocean. The goal is to show grassroots support for stopping offshore drilling, reducing plastic pollution, and preserving coastlines in the face of rising seas. Surfrider Foundation will have a strong presence at the march, with chapter members and staff traveling to our nation’s capital for the event. Those who can't make it to Washington D.C. are encouraged to 'Wear Blue for the Ocean' to show their support in local communities and on social media. For more information go to: www.marchforocean.com and engage with #MarchForOcean on your favorite social channels.